Every city has its heroes that leave an eternal mark on the place. However, few cities are as enchanted as Buenos Aires is with Maria Eva Duarte de Peron. Eva Peron was first lady to the president of Argentina, Juan Peron. Evita, as she was known by her hordes of devoted fans, was a saint-like defender of the poor. She was instrumental in Argentinean suffrage before her untimely death to cancer at the age of 33. 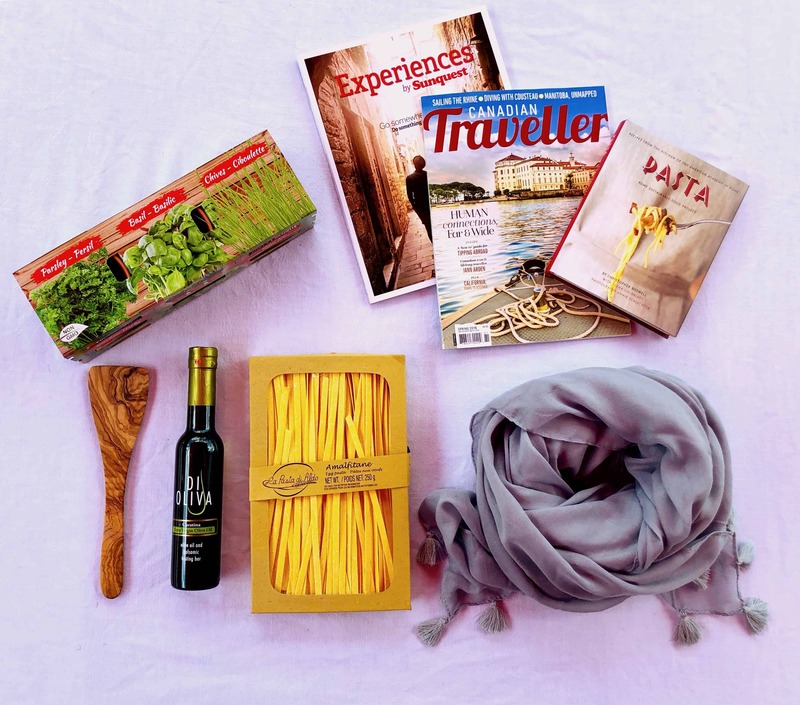 She has been immortalized around the world in the 1978 musical Evita by Andrew Lloyd Webber and Tim Rice. In Buenos Aires, however, the sites contributed to the city by Eva Peron are preserved diligently so that subsequent generations never forget her contribution. 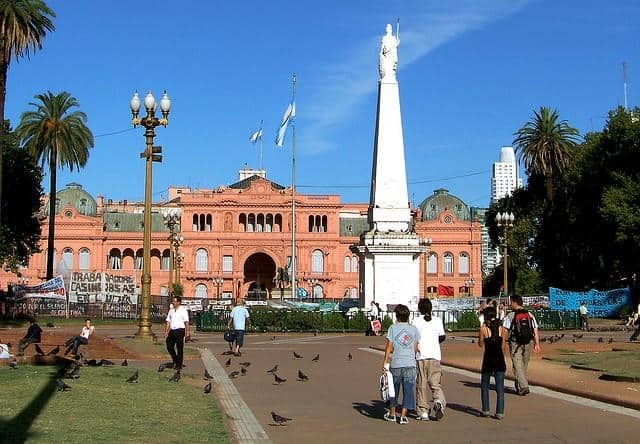 The Casa Rosada, also known as the Pink House, is the presidential palace in Argentina. From the balcony, Evita addressed hordes of Peron supporters gathered below in the Plaza de Mayo. These followers were also known as the 'shirtless ones', as many of them were poor labourers. This iconic balcony became the setting for Don't Cry for Me Argentina, the signature song of the musical based on Eva's life. As Casa Rosada still serves as the residence for the Argentinean president, visitors cannot just meander through it as they please. It is closed to the public during the week, but the government runs free tours on the weekends. While there are no cheering crowds below, it is a thrill to stand where such a beloved woman once stood. Since 2011, the Museo del Bicentenario has stood directly behind the Casa Rosada. A visit to this museum pairs well with a tour around the presidential palace, as it contains objects related to both Eva and Juan Peron, such as presidential regalia, clothing and campaign posters. The Casa Rosada tours gives a lot of background on the couple, but it does not give much in the way of visual effects. However, the Museo del Bicentenario provides all the visual effects that visitors could want. Under Eva Peron's direction, the Argentinean state bought the mansion that is now Museo Evita in the Palermo neighbourhood in 1947. The mansion was then remodeled and turned into a shelter for single mothers. When Juan Peron was deposed in 1955, the shelter remained in government hands, but it was turned into an office for the disabled. The building slowly became defunct in the 1980s, but in 2002, to commemorate that 50th anniversary of Evita's death, the building was restored and reopened. This time the mansion was used as a museum. 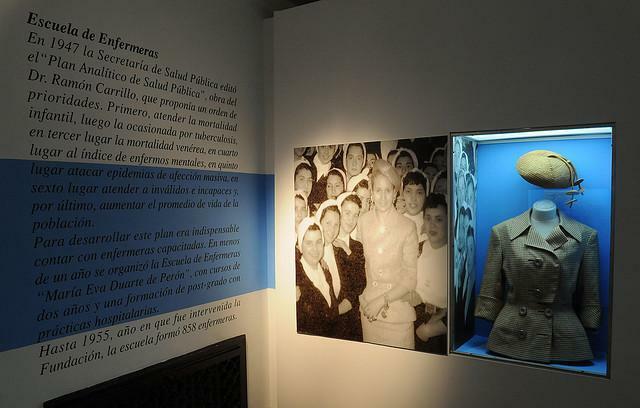 Museo Evita showcases Eva Peron's extensive and lavish wardrobe, as well as other select items from the Eva Peron Historical Foundation, including some of her earlier films. The Foundation and Museo Evita are run by Evita's own grand-niece, Cristina Alvarez Rodriguez. After women gained the right to vote in 1947, a wave of female politicians entered the various political offices of Buenos Aires. Within the drab gray granite Congress building there was one room that Eva Peron created that wasn't dominated by men. The Salon Rosado, or the Pink Room, was a women-only parlour for female politicians where they could gather and discuss important issues of the day without men around. This beautifully decorated room has been preserved and is now called Salon Eva Peron. Its original furnishings have been preserved and the room is now open to the public. It was in this room where a viewing site was set up for the official two week mourning period for Eva Peron after her death. Up until 1999, the city of Buenos Aires had a lot of different sites that commemorated the contributions of Eva Peron, but no official monument had been built. 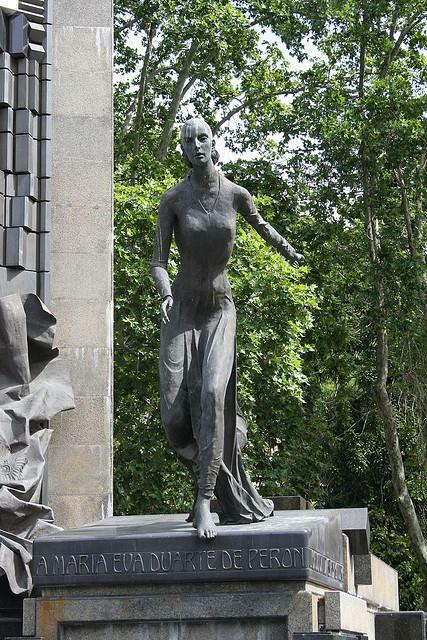 In 1999 on the hillside below the National Library, a beautiful bronze statue of the woman was unveiled. The site of the Evita statue is where the former first lady's house once sat. The residence was demolished after the coup of 1955. The statue is located roughly in the location where Juan Peron had planned to build a colossal monument to himself, Evita and a symbolic worker referred to as Descamisado. While there are hundreds of museums dedicated to Eva Peron, this is the only statue in the whole of Argentina that celebrates her. Many of the institutions that Eva Peron created around the country have now fallen apart save for one –Colonia Chapadmalal. This is the site of an enormous Bavarian-style beachside complex that the Perons built for the poor and working people in 1952 outside of Mar del Plata. Mar del Plata is the country's largest resort town. 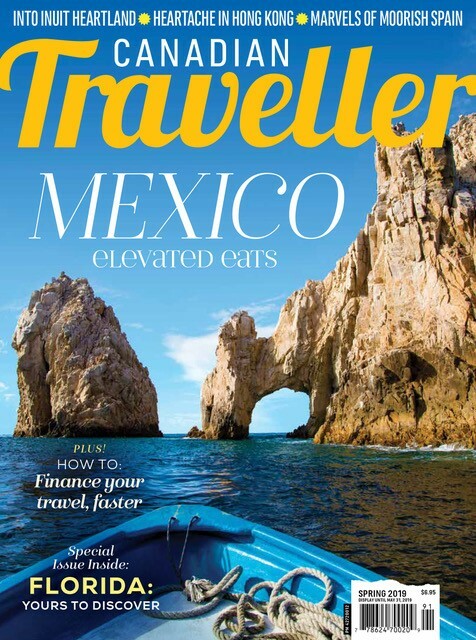 It is just four hours outside of Buenos Aires, so the wealthy often flock there for getaways. However, in the 1950s, the poor and working masses could not afford luxurious beachside vacations. Colonia Chapadmalal is an affordable beachside resort were the working poor could get away for a vacation that would not break the bank. Visitors can stay in Chapadmalal, which has now been partially turned into an Evita museum. However, as Chapadmalal is so historic, there is a lengthy application process to stay there. The General Confederation of Labour is a union office that was constructed by Eva and Juan Peron in the late 1940s. Tourists passing by will see the beautiful portrait of Eva Peron on its central tower. This portrait is constantly lit by the eternal flame, honouring her memory. 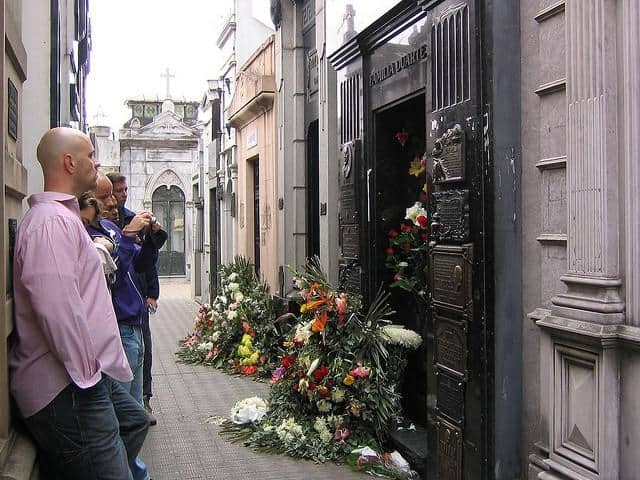 The room that once held Evita's body has now been turned into a small museum. Photos from the turbulent period now line the walls and the platform where he body once laid is a centrepiece to the museum. Nearby is the Fundacion Eva Peron Engineering School. This imposing columned building was once home to the Eva Peron Foundations, where the woman herself distributed money to families in need. A tiny plague in front of what is now an engineering school serves as the sole reminder. After her death, Eva’s body did not stay at rest; her coffin travelled across Argentina, Spain and Italy. However, in 1976 her body finally came home to Buenos Aires where it belonged. Within Recoleta Cemetery, Eva’s body lies at the Duarte Family Tomb. Visitors will have no trouble spotting her final resting place, as it is permanently littered with flowers and notes. This number of mementos swells on July 26th, the anniversary of her death, and October 17th, the date that Juan Peron came to power.